Also known as demyelinating optic neuritis, optic neuritis refers to the inflammation of the optic nerve due to the loss of or damage to a protective covering called myelin, which surrounds the optic nerve. The myelin is essential to the function of the optic nerve. A more general term, optic neuropathy, refers to nerve damage or abnormalities due to blocked blood flow, disease, or toxic exposure. Optic neuritis is a type of optic neuropathy. Several vision symptoms accompany optic neuritis including blurred vision, blind spots, pain with eye movement, and reduced color vision. These symptoms typically precede a loss of vision. If left untreated, optic neuritis can lead to permanent optic nerve damage and permanent loss of visual acuity. Although the exact cause of optic neuritis is not yet understood, optic neuritis occurs when the body's immune system mistakenly attacks the myelin, which protects your optic nerve. The myelin is vital for the proper function of the optic nerve. When damaged, the nerve cannot efficiently transfer electric signals/information from the eyes to the brain, hindering vision. Optic neuritis tends to occur in conjunction with several medical conditions, disorders, and diseases including multiple sclerosis (MS), neuromyelitis optica, systemic lupus erythematosus, sarcoidosis, Lyme disease, ocular herpes, syphilis, measles, mumps, and sinusitis. In addition, optic neuritis can also develop in reaction to certain medications. Most common among women, young adults between the ages of 20 and 40 are at the greatest risk of developing optic neuritis. 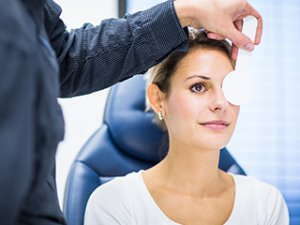 Eye care professionals diagnose optic neuritis using a series of tests and evaluations including a routine eye exam, an ophthalmoscopy (to inspect the back of the eye, looking for a swollen optic nerve), pupillary light reaction test (to check for abnormal function of the pupil), and blood tests. Patients diagnosed with optic neuritis are much more likely to develop MS. As a result, if a patient is diagnosed with optic neuritis, an MRI will often be recommended to look for further signs of nerve damage and the possible development of MS. Optic neuritis may clear up on its own. If, however, it does not, an eye care professional will usually recommend a regimen of steroids administered both orally and intravenously to reduce inflammation and suppress the immune system. If signs of MS are present in the patient, medications to slow the onset or development of MS will also be prescribed.